Last week we promised to explore the Green Revolution. The term “Green Revolution” was coined in the 1960s to highlight a particularly striking breakthrough in yields, which is the traditional way to measure agricultural performance – in tonnes per hectare, bushels per acre or whatever. Farmers have been trying to improve yields by improving seeds through experimentation since the beginning of time – they’d keep seeds from the biggest, highest, most vigorous plants to sow the next spring. These seeds are the product of thousands of years of experimental plant breeding by millions of farmers across the world. The crops that humanity has painstakingly bred (sometimes from wild plants) are the kernels of our civilization. Much of the reason why these “high yielding varieties” produced more than traditional varieties was that they were more responsive to petrochemical fertilizers. To produce their high yields, the new seeds required far more fertilizer than traditional varieties could absorb. Fertilizer – inducing a demand for it, supplying it, teaching farmers to use it and putting it to work – is one key to the Green Revolution. In fact, some people say the term “high-yielding varieties” is a misnomer, because it implies that the new seeds are high yielding of themselves. The distinguishing feature of the seeds, however, is that they are highly responsive to certain key inputs such as fertilizers and irrigation water. They say the term “high responsive varieties” is more appropriate. There is yet another aspect of the Green Revolution which tied agriculture to the petrochemical industry: by developing high yield varieties of crops, farmers chose to grow these seeds only – so only a few species of (for example) rice were grown. In India for example there were about 30,000 rice varieties prior to the Green Revolution, today there are around ten – all the most productive types. By having this homogeneity the crops were more prone to disease and pests because there were not enough varieties to fight them off. In addition, because of their narrow genetic base, they’re inherently more susceptible to pests, so monocropping provides a large and often permanent niche for pests, turning minor diseases into epidemics. In order to protect these new varieties, more pesticides and insecticides were used, so pesticide use grew as well. During 1970 – 1990, global pesticide use more than doubled, from 1.3 to 2.9 million tons per year. 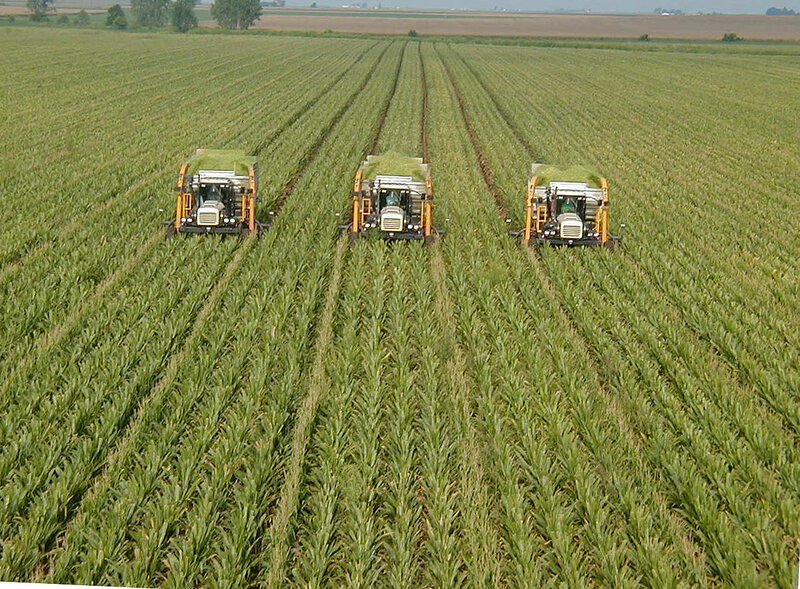 Thus agriculture became inextricably tied to the petrochemical industry, because these new seeds wouldn’t grow well without petroleum-based fertilizers – and they also required additional labor. These inputs increased farmers costs: the high yields of IR-8 (a new rice seed) was four times as costly to grow as ordinary rice because of the fertilizers, pesticides and additional labor required. Irrigation also played a large role in the Green Revolution. It changed the areas where various crops can be grown: For instance before the Green Revolution, agriculture was severely limited to areas with a significant amount of rainfall, but by using irrigation, water could be stored and sent to drier areas, putting more land into agricultural production – thus increasing nationwide crop yields. Yet the energy inputs have continued to increase without a corresponding increase in crop yields – so modern agriculture must continue to increase its energy expenditures simply to maintain current crop yields. And what will we do when the oil runs out? What has the Green Revolution accomplished? Nobody denies it was a screaming success in terms of yields: over a twenty-year period between 1970 and 1990, average yields of corn, rice and wheat more than doubled; as a consequence there was an 11% increase (on average) in food per person because of these increased crop yields. Today, though, the miracle of the green revolution seems to be over: Disturbingly, for the first time since the Green Revolutionm, crop yields are growing more slowly than population – in other words, growth in population and demand for food have both slowed down, but crop yields have slowed even more. Between 1961 and 1990, wheat yields were growing by about 3% per year. From 1990 to 2007, wheat yields grew by only 0.5%. In Central Luzon, Philippines, rice yields grew steadily during the 1970s, peaked in the early 1980s, and have been dropping gradually ever since. Long-term experiments conducted by the International Rice Research Institute (IRRI) in both Central Luzon and Laguna Province confirm these results. Similar patterns have now been observed for rice-wheat systems in India and Nepal. In West Java, a 23 percent yield increase was virtually canceled by 65 and 69 percent increases in fertilizers and pesticides respectively. In the Punjab, the crowning success of the Green Revolution, yield growth has essentially flattened since the mid-1990s. Over-irrigation has led to steep drops in the water table, now tapped by 1.3 million tube wells, while thousands of hectares of productive land have been lost to salinization and waterlogged soils. Forty years of intensive irrigation, fertilization, and pesticides have not been kind to the loamy gray fields of Punjab. Nor, in some cases, to the people themselves: so many people now take the train from the Malwa region in India to the cancer hospital in Bikaner that it’s now called the Cancer Express. Daniel Pepper, writing in US News and World Report , reported on the toxic consequences of the Green Revolution among Indian farmers, to read it click here. A year ago I sat in a room at the Earth Institute at Columbia surrounded by executives from big food companies. One of them, I believe from Unilever, clicked to a slide that read “The solution to global hunger is to turn malnutrition into a market opportunity.” The audience—global development practitioners and academics and other executives—nodded and dutifully wrote it down in their notebooks; I shuddered. The experience stayed with me and I haven’t gotten over it. Last month, I had a flashback. On a Tuesday evening I sat in a room on the 44th floor of a building in the financial district of lower Manhattan with representatives from General Mills, Monsanto, Dean Foods, Deutsche Bank, and the Rainforest Alliance. We were there to speak to institutional investors—the hedge fund managers, bankers, and others who invest in big food companies—about sustainability and food. In particular, we were there to talk about how sustainability and hunger issues may give these companies both exposure to risk and access to opportunity. Both Deutsche Bank and Monsanto made it clear that they are basing their business strategy on answering a simple question: How will we feed the world in 2050, when the population reaches over 9 billion and global warming puts massive strains on our resources? The answer for Deutsche Bank: increase yields by investing in industrial agriculture in the developing world, with an emphasis on technology; put lots of capital into rural land to shift subsistence and local market agricultures to commodity export agriculture. The answer for Monsanto: increase yields by decreasing resource dependence using genetically modified crops. Sounds good on paper, but Josh Viertel says it’s based on a false premise. What is the false premise? Tune in next week. (6) Pfeiffer, Dale Allen, “Eating Fossil Fuels”, from The Wilderness Publications, http://www.copvcia.com. Bourne, Joel K. Jr., “The Global Food Crisis: The End of Plenty”, National Geographic, June 2009.